In a world in which the word ‘organic’ holds the power that the Vatican does amongst Catholics, it’s easy to be a cynic, an org-nostic. Dissent comes naturally when those around you seem to agree unquestioningly with the lines they’re fed – by the shops, by the chefs, by the media. Devil’s advocate I may be (and frequently am) but I’m not sure that ‘organic’ is all that it’s cracked up to be. My parents grow fruit and vegetables in their garden; being unequipped with greenhouses or covered, irrigated structures, their produce is largely open to the elements and, of course, the birds and insects. No doubt from time to time they spray their fruit trees with pesticide, or dig the flinty Chiltern soils with fertiliser. Even then our Christmas sprouts often yield a surprising morsel of ‘extra protein’, as my mother calls the caterpillars that besiege my father’s vegetables. She painstakingly wraps the cherry tree branches in old pairs of tights in a bid to deter the birds, who invariably take the best of the fruit before we get the chance. Are, then, my parents’ vegetables and fruit to be black-marked as ‘non-organic’? Were they ever to sell them, I expect this would be the case. And yet what better flavour, and what respect to the environment, to pull a parsnip from the winter soil, to pluck a fragrant tomato bursting from its skin, or to pop peas straight from plant to pod to plate? Organic they may not be, local they are. I’m not sure whether Restaurant de Kas uses the O word in its blurb – I expect it probably does, given its reputation. But what’s striking is the proximity of its raw ingredients to its kitchen. 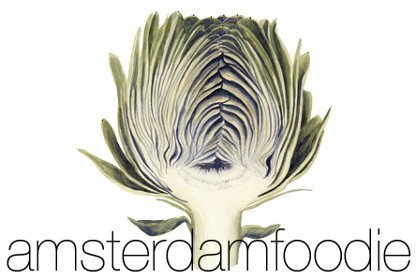 What the restaurant’s gardeners don’t produce within a 100m radius of the venue arrives daily from farms neighbouring Amsterdam. It’s hardly surprising, then, that the five-course menu offers no choice to diners, as the chefs base what they cook on what is picked, plucked or pulled each day. Moreover, meat, fish, dairy and other products that are harder to source locally, simply feature very little on the menu. To my mind, a set menu has other benefits too. I am often disturbed by the weight of the book with which I’m presented at some restaurants, on the grounds that I’d rather a chef concentrates on making five dishes well than fifty badly. How can they even guarantee the freshness of the ingredients? It follows, then, that the fewer the dishes, the higher the quality. Well, that’s the theory anyway. The visit of my vegetable-growing parents and siblings was the cause of my trip to de Kas. 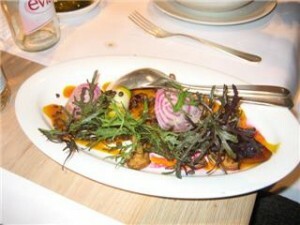 We are a family of foodies, and therefore hard to please, but the green-housed restaurant impressed us all. The first three of the courses were served simultaneously, which was strange but inoffensive; for some reason, though, we still chose to eat them in the order in which they were announced. 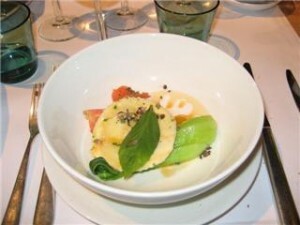 In a bowl, we savoured a single goat’s cheese ravioli (raviolo?!) atop braised pak choi, yellow cherry tomatoes and a red pepper salsa. 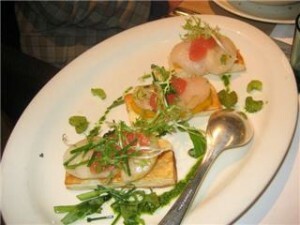 Next, we had a puff pastry crouton topped with pumpkin puree, a raw scallop and a slice of pink grapefruit. Our third starter comprised a salad of variegated beetroot, turnip, leeks, cucumber and puy lentils with an intensely flavoured dressing that was orange in colour but whose identity was beyond me. All three were as fresh as spring rain, cooked to perfection, uniquely flavoured and beautifully presented. It’s not often that the Amsterdam foodie sheds her characteristic skin of cynicism, but even I was full of oohs and aahs. 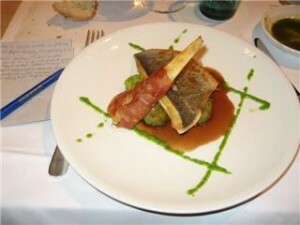 The main course was dorade with pesto-dressed new potatoes and sauerkraut; perched against the fish was a roasted parsnip wrapped in prosciutto. Often these multi-course meals leave you feeling bloated, their richness precluding the desire for dessert. The food at de Kas is light but satisfying, proving that it is possible to return home from a restaurant feeling like going out for dinner is actually healthy. 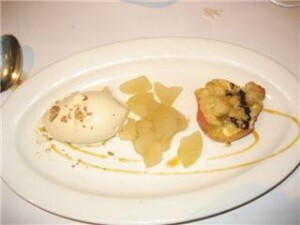 With the exception of the ice cream (and let’s face it, dinner wouldn’t be dinner without a little guilt), dessert was no exception; the apple crumble was served inside a halved apple with a caramel sauce. Appropriately, our meal was rounded off not with an espresso, but with a fresh mint tea whose leaves were picked from the greenhouse, of course. My sister-in-law was distressed that no koekje was forthcoming. But where does one procure an organic, free-range biscuit within the A10?